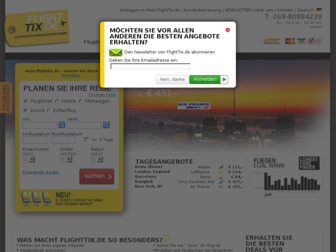 Fliegen Sie günstiger mit Ftix.de, dem günstigsten Preis finder in Europa. I booked flights from and to the Galapagos ISlands - a place which is not that easy to get to and also super expensive. What happened is that i had to pay an additional "fee" of 110USD (!!!) at the Airport in Guayaquil (Ecuador) because "something was wrong with my ticket". I talked to the operating airline which of course referred to to the Website i booked the flight with - Flighttix. So i send all receipts and everything i had as a complaint to Flighttix and guess what happened? Correct. NOTHING! Will never book with them again.